I can’t believe it has taken me so long to come over and talk to you about this Conair su1w sound therapy sound machine. I have been using this machine for the last 6 years in my Newborn Care Specialist business and love it. Now, I may be a bit biased in this review but there is good reason for it. Since I have a unit that is still in the box, I thought I would do an unboxing video so that you could see the white noise sound machine straight out of the box – which you can check out at the bottom of the post. Like I said earlier, I started using the Conair SUIW Sound Therapy sound machine about 6 years ago to help soothe the newborns that I was working with at night. When I first started using it, I didn’t exactly love it; in fact, I hated it. I was use to sleeping in peace and quite at night. I could not understand why a baby would want or need anything like this in their room to help them sleep. I mean, I knew that consistent sound was important to them to help them relax but this was a bit much in my eyes. But it was not long until I changed my thinking of this machine. 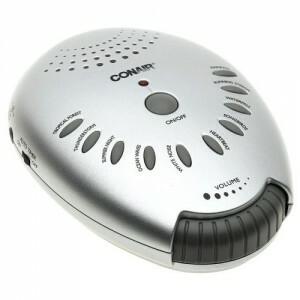 After using another white noise machine, I realized that Conair had nailed it when they created the SU1W Sound Therapy Sound white noise machine. They had thought of everything from continuous sound to the types of sounds that played on this machine. The machine comes with 10 different sound settings. I have listed them here so that you can check them out. There is a sound on the Conair SU1W sound therapy sound machine for everyone. You will never get bored in my opinion with this sound machine. It’s perfect for the smallest of newborns learning how to sleep through the night. Or for adults who might have a difficult time falling a sleep at night at home or traveling (unfortunately, I’m one of those adults). Oh, before I forget – there are a few other great things about this machine that I love. It has a big on and off button with a little red light. It make is super easy to turn off — even with your foot which makes it easy to turn off with a baby in your arms. The volume button is huge and VERY easy to rotate. For those of you how don’t want the continuous sounds, there is an auto times switch on the side that allows you to put the machine on a timer. For those of you who have one, I would love to hear your thoughts on this machine. Do you love it as much as I do? I would love to hear your thoughts on it. Your comments are ALWAYS welcome below! Have this! Love this! Included it in my list of 5 must-haves for newborns! And, I turn it on with my feet all the time! Ha, good to hear you use your foot too to turn it one it off. It’s one of the reasons I love this sound machine so much. It’s a great little sound machine.